This is something totally alien - me fleeing the winter snow for southern climes! I'm not running away though; I'm on assignment following endurance rides around the southwest for a couple of months. And while I'm sorely missing the frigid Pacific Northwest, and every snowflake that falls there, and every bone-chilling shiver down my spine, I'm soaking up the splendor of the Southwest (while sweating). There is, however, some chilly, wet, blustery weather heading our way Wednesday and Wednesday night, but that will just set up the trails and the days perfectly for the 3-day Resolution Endurance Ride which begins on Thursday near Scottsdale Arizona. Expect cool and spectacular sunny days (on Thursday after the rain stops) in this Sonoran desert, the hottest desert in North America (in the summer! 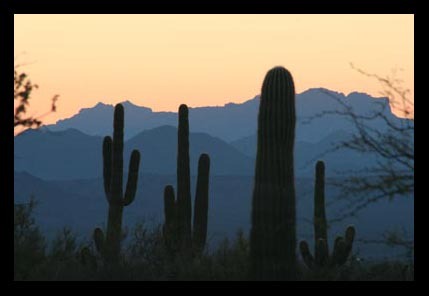 ), the only one where you'll see - and ride through - forests of Saguaro Cactus, the state flower of Arizona. Here is a taste of the scenery you'll glimpse on the trails. Oh, Merri, I'm more than slightly jealous! I grew up and began my horsey life in Phoenix, eventually transplanting to Tucson. It's such quiet, deep beauty . It always takes me two days to drop down to how quiet the desert is. Enjoy every moment! Best wishes to you & yours in 2011!